It’s been a while since we had something large enough to require a major assault, but the giant water oak down right near the end of Bayou Fountain is officially a Bad Tree. 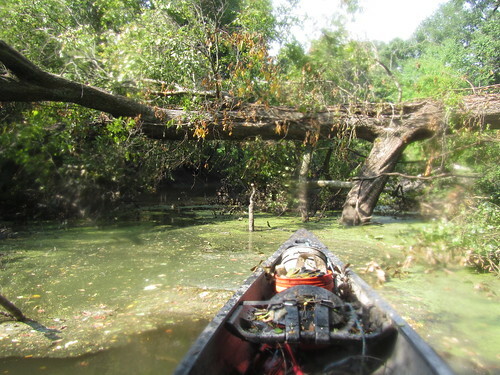 After discovering the tree on Friday’s paddle, I immediately called for backup. This was no spindly little four-incher or bristling-with-thorns locust tree. This was a giant water oak. I told Mike to cut his weekend short and join me for the assault, and we lined up someone to come with a motorized boat large enough to use as a platform for chainsaw work. Sure, we’ve done basically everything with hand saws and brute force, but even we can tell that once in a while you have to call in the heavies. With basically everything else already handled Friday, the two-mile paddle to the site was uneventful even in the significantly low water. Soon enough, we’d arrived at the Bad Tree and started working. I slid by and cut one underwater obstruction to make the way clear for our mechanized division’s arrival, and then Mike and I both got to work pruning and sawing to remove as much material from the crown as we could reach to make everything ready for chainsaw time. After a few hours of manual labor, we finally heard from our mechanized division. 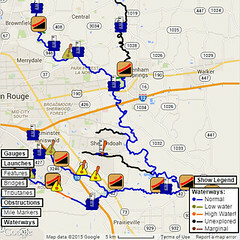 Turns out, they had been unavoidably waylaid at base before they had even departed to head up Bayou Manchac to meet us. All the crown-side work we’d been doing to prep for chainsaw use was now of little use, as we weren’t going to saw all the logs by hand (at least not this time). 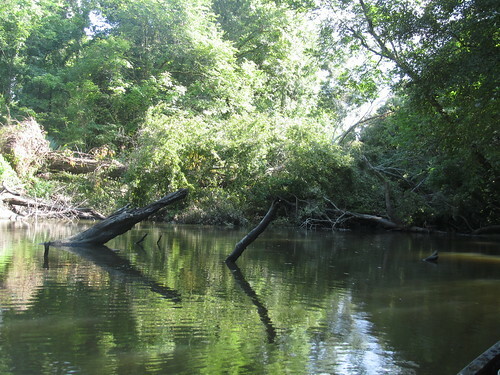 We immediately refocused to improving the “tunnel” on the root side of the bayou. After hours more work, we had everything in reasonable shape, considering. On the crown side, we had removed enough branches and limbs that if the water is too high to pass under the trunk, passing over the obstructions on the crown side should not be difficult. With the water at low to normal levels, on the other hand, the tunnel should be sufficient for now. With the Bad Tree in a temporarily adequate state, we called it a day and started heading back to the park. Along the way, we ran across a family of four out for a Highland Road Park to Manchac Park paddle. 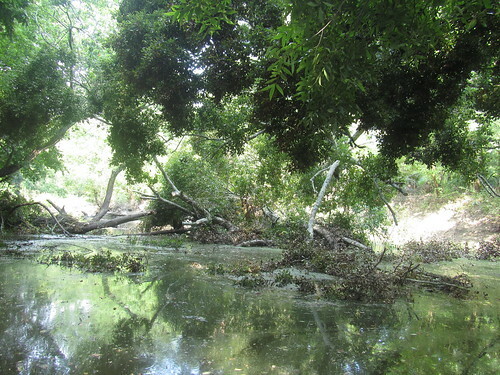 (With the water as low as it was, the entries and exits are a bit… adventuresome… but the paddling is still worthwhile.) After we passed each other, Mike decided it was time to take me up on my standing offer: I always tell people paddling with us that if they end up too worn out, I will gladly tow them. Mike had valiantly spent the entire day working in sweltering heat and humidity, and I was happy to give him a chance to take a 90-minute canoe nap during the last 2.6 miles. 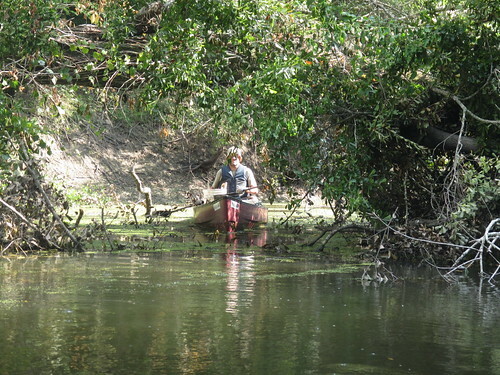 I tied off Mike’s work canoe behind mine, then tied off the gear canoe behind that. (We didn’t get to use anything from the gear canoe, as our work platform never arrived, but at least it was relatively light.) I admit that I made somewhat slower progress back upstream, but I’m going to blame that on the extreme currents I was having to fight. (Nobody needs to know that there wasn’t much of any current, right? If they know that, they’ll figure I was just… tired!) We made it back to the park and up the rather tall bank with daylight to spare. Mike looked completely beat, so I sent him home and took my time loading up all my gear and canoes. 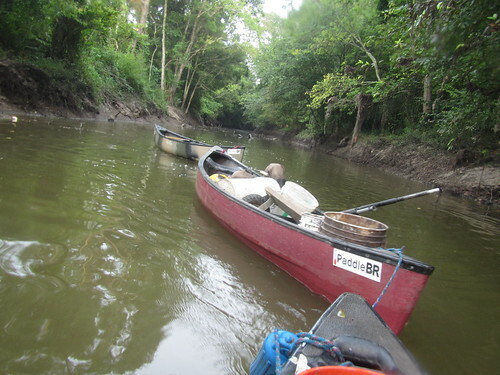 It was a productive day, and even if we didn’t complete the mission as planned, not having our mechanized division assisting, we did enough that nobody should have a problem paddling the bayou. We’ll hit the Bad Tree again, with or without powered help, and we’ll have it all wrapped up soon enough. 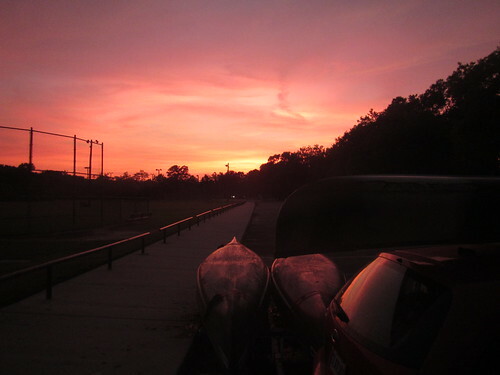 It was the end of a long Sunday wrapping up a very long weekend of working Bayou Fountain and paddling University Lake, and I finished loading up while watching the sky change to a beautiful palette of sunset colors. Finally, with the fading light of a beautiful evening sky and the knowledge of a job well done, I happily headed home for a well-earned rest.